Clothing, jewelry, home decor, high-tech, cameras, toys ... New York City is the world capital of shopping. Here, you will find any kinds of shops for every budget. Our shopping guide gives you all the main addresses, whatever you are looking for. Whether you like sneakers or more formal shoes, you will what your need for your foot in New York City. You will also discover brands and models before their arrival in Europe. In New York City, you will find everything you need to pamper you! Or course, you will find all the main European brands but also a wide choice of American products and perfumes. Just try them! Glasses, ties, belts, underwear... The list of accessories is of course very long! In New York City, you will find all you need in the department stores but also in these little and specialized stores. Paris has the Galeries Lafayette and London has Harrod's... And what about New York City ? The Big Apple has more, with several department stores! These huge malls offer an incredible selection of products and brands. Ladies, your next handbag awaits you in New York City ! Gentlemen, now you know what you have to do : don't forget your wallet... In New York City, you can buy a new one for you ! Rings, necklaces, earrings... New York City is an expert in jewelry ! Did you know that the 47th Street, between Fifth Avenue and Sixth Avenue, has been renamed "Diamond District" ? If you want to prepare your picnic or if you are looking for american products, have a look the these grocery stores and supermarkets. The most difficult thing now will be to resist the temptation to try everything! Football, golf, cycling, jogging, hiking... Here is everything you need if you want to exercize. And since you are in New York City, what about playing baseball or basketball ? New York has some unusual shops ! This is the case of Christmas Cottage, which sells Christmas decorations all year round. Or Spy Store and its secret agents gadgets. 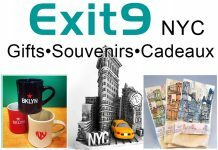 Or also Exit 9 and its crazy inventions ! New York City is home of some of the greatest names in American literature as Mary Higgins Clark and Paul Auster. New York City is also the city of superheros like Spider-Man, Superman, Batman or Captain America. It's impossible to leave New York City without plenty of souvenirs ! Here are shops that offer you to take a piece of New York City with you, from t-shirts to mugs or keychains. Whatever your passion, there is a shop for you in New York City ! You will find a lot of shops dedicated to collections and hobbies. And some of them are unusual! Whether you are a fan of rock n'roll or chill out music, you will find what your are looking for in the New York City's records stores. New York City is also famous for its musical instrument shops. What about bringing a small New York gift to your favorite pet ? In New York City, you will find classic and original ideas for your dog, your cat or even your goldfish. To get a complete overview of New York City, book your city tours ! This is the opportunity to combine several different means of transport: bike, helicopter, tourist bus, private limousine or jet ski. A cruise in the New York City bay is one of the highlights of a trip in the Big Apple. You can choose between several companies and different kind of ships, depending on your preferences and your budget. Welcome on board! The limousine is simply the best way to go from the airport to New York City. Apart of the airport transfers, you can also book a limo for city tour or a private party. Let's go! What about a great party? New York City has some of the best nightclubs in the World, from Webster Hall to Pacha NYC. Here are the addresses that make the Big Apple dance. Find ideas for unusual gifts! Rent a Bike and discover Manhattan on your own way ! Ali Baba's cave for music fans, from LP vinyl to CD’S ! Whether you are a professional or amateur photographer, you have to check out the Photo shops in New York City : you will find an amazing choice at prices much more interesting than in Europe. PCs, laptops , tablets, smartphones, softwares... All the latest technologies are waiting for you in New York City ! And don't miss the famous Apple flagship store on the Fifth Avenue. From 18th century French porcelain to Art Deco, New York antique dealers offer a wonderful journey through time. Some shops, such as Alaska on Madison, will even surprise you! In New York City, art is not limited to museums: you must also explore art galleries! Their exhibitions feature well-known artists but also young talents that challenge contemporary art. Whether you are a fan of America's Test Kitchen, Hell's Kitchen or Master Chef, show your cooking skills! But, before, push the door of these shops dedicated to the kitchen and household items. To give a revamp to your home, check out these home decor shops. You will find a lot of unique items, including New York City posters and other ideas you will be able to bring back home. You are sick and you don't have any drugs with you? That's not a problem: there is everything you need in New York City to treat you! Here are addresses of pharmacies that can help you.